IN THE context of a tournament which had so far produced a draw and wins by two, six, one and four points then this could well be called the “hiding” that England coach Eddie Jones had controversially predicted. 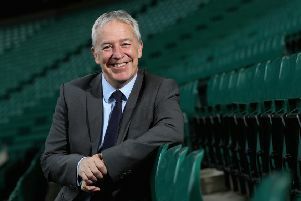 It was at BT Murrayfield eight days previously, after seeing his reign get off to a winning start in the Calcutta Cup opener, that the Australian had looked ahead to this trip to Rome and informed the press of his side’s intention to “smack Italy” and give them a “good hiding”. Jones spent the week being asked about these comments and whether they could be viewed as disrespectful. In his inimitable style he shrugged it all off brazenly and was vindicated in the Eternal City yesterday afternoon. The Azzurri were competitive into the second half but, when stand-off Carlo Canna missed a kick that would have put the home side 12-11 up just after the break, the wheels came off the Roman chariot and the game swung England’s way. Centre Jonathan Joseph notched a hat-trick – the first by an Englishman in the Six Nations since Chris Ashton’s against the same opponents at Twickenham five years ago. His treble was book-ended by scores from George Ford and Owen Farrell as the Italians fell away dramatically in the final quarter. Scotland travel to Rome next and yesterday there were mixed messages for Vern Cotter and his coaching staff to chew over ahead of that vital encounter. On the one hand there was real fragility exposed in the way the Italians finished the game, but much to admire in how they performed in the opening 50 minutes, with centre Michele Campagnaro looking a class act. One thing for sure is that the Italians will not be weighed down by any psychological barriers as they prepare to welcome their favourite opponents in the tournament. England are a different matter, however, and Italy have now lost all 22 meetings between the two nations. From the moment Joseph pounced on an interception chance after that missed kick from Canna, it was clear that the record was going to continue. Jones emptied a bench stacked with talent, including a first cap for exciting young back-row prospect Maro Itoje and England powered home. Canna’s three penalties had kept Italy just two points off the lead at 11-9 going into the break, with Ford’s well-taken try giving the visitors the edge. Wing Leonardo Sarto will have nightmares about the floated pass which Joseph gobbled up with glee. Five minutes later he crossed again, collecting a gorgeous grubber by Danny Care and strolling over. The hat-trick was completed with a show of strength at the corner before Farrell arrived to deliver the final blow when he finished off a sweet and swift interchange of passes by a now rampant England attack. A satisfied Jones said: “We thought we’d get our points in the last 20 minutes and that’s how it turned out. We let them into the game in the first half with ill discipline. “But in the second half, we got our rhythm and it was a pretty good performance.